Clackamas High School's Cavalettes dance team closed out the season on a high note Saturday. Led by All-State selections Sophia DiNucci and Molly Nagel, the Cavalettes scored 86.00 with their "With You There" routine and placed second in the Show Division at the OSAA Dance and Drill state championships at Veterans Memorial Coliseum in Portland. Canby scored 88.27 with its "Together, Alone" number to win the Show state title for the fifth year in a row, while Stayton scored 91.48 — the highest score across all divisions — to clinch the 4A/3A/3A/1A title for the second time in three seasons. Gladstone's Gladettes claimed the third-place trophy in the 4A/3A/2A/1A division, and Gladstone coach Denise Harris earned Coach of the Year honors in what she said would be her final season with the Gladettes. In Friday's finals, Tigard scored 86.63 to runner-up Lincoln's 86.42 to win the Class 6A title, and Pendleton scored 79.98 to capture the 5A title. Milwaukie's Pony Prancers took home the 5A fifth-place trophy, while Putnam's Royal Crowns placed seventh in Show, and Oregon City's Jets placed 17th in a field of 22 teams in 6A. More than 1,300 dancers representing 56 high schools competed during the two-day event, which featured a one-round format for the first time. For Clackamas, Saturday's second-place finish marked the third time in six seasons that the Cavalettes have finished as the runner in Show. It also marked the 17th consecutive year in a row the Cavalettes placed in the top five. "We are so happy," Clackamas coach Alexsis Woolsey said. "We have such a competitive division. Second place feels great and we are so proud of our girls. They went out there and did the absolute best they ever could. "We felt like we had a chance, but Canby is such tough competition and is always so amazing every year. This season, we never competed against them until the state championships, so it really was a roll of the dice and Canby showed up. They did amazing." 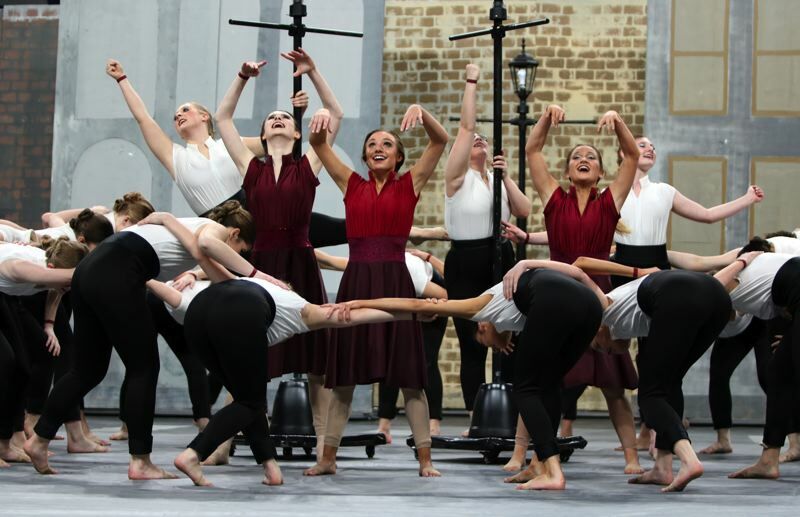 Clackamas was the last of the 11 Show teams to perform on Saturday, putting a bit more pressure on the Cavalettes as they took the Coliseum floor in front of an elaborate cityscape and performed to 2Cello's rendition of U2's "With Or Without You." The Cavalette's storyline featured three soloists — junior Hailey Dickerson, DiNucci, and Nagel — who are new to the big city trying to find their way among the daily commuters and pedestrians. "The commuters are all focused on their own lives, not caring about others around them," Nagel said. "Then they kind of notice us and take us under their wing and that's when we put our hair up and start looking like them. Then at the end, we find our confidence and our place with each other, and then we're free to be ourselves again. "We really just wanted to leave the audience with a feeling, and we didn't really want to dictate what that feeling was, but just some kind of feeling of happiness or satisfaction." Added DiNucci: "This is probably the best state routine the dance team has had over the past four years." to help kick off the awards presentations, the Dance & Drill Coaches Association presented academic scholarships to Nagel, Putnam's Lydia Bilby, Parkrose's Amy Bonilla, and Marshfield's Payton Davidson, and presented dance scholarships to DiNucci, Nagel, and Valley Catholic's Ashley Chu. Putnam's Royal Crowns, competing in Show for the third seasons in a row, scored 73.98 for their "Welcome Home" routine, performed to Billie Eilish's "Lovely." "This was their best performance of the season, so they peaked at the right time, for sure," Putnam coach Amanda Wilcox said. "It's a team filled with rookies. Of the 20 dancers, we had 11 new members and this was their first time on the Coliseum floor." Wilcox called it "a really fun, really successful season," especially for the team's seven seniors — Britney Hart, Braedn Johnson, Haley Johnston, McKenzie McHarness, Mackenzie Strauss, Clarissa Vavrosky, and Bilby. "We just got our full set put together this week and Wednesday was our first performance with the full set, so this is pretty exciting. Performing without the full set is really hard, so to finally have a full set to help tell the story has been really helpful for the kids." In the 4A/3A/2A/1A division, Gladstone's Gladettes registered a score of 82.63 for their "The Farewell Tour" routine, which doubled as a tribute to the team's seven seniors and Harris. "Yes, we are thrilled to be in the top three, are you kidding?" Harris said. "I mean, it was a hard fight to get into the top three. In fact, going into state, we were fourth, but not solidly. So, to secure that third-place trophy is huge and it's a big win for us." Harris saw it as the perfect sendoff for herself and Gladstone's seven seniors — Jasmine Guenther, Sophia Gustafson, Aleisha Kerr, Jody Perrier, Evie Skelley, Tristan Suskie, and Sabrina Ward. "It's all about leadership," Harris said. "This team has seven seniors, three of them are captains, and your team is only as strong as its leaders. These leaders are selfless, they do the work, they're prepared, and they have a lot of heart, so where they lead, these kids followed." Gladstone's Gustafson also was among the last dancers standing in the drill down competition, finising third behind Grant's Abby Franking and Sprague's Amanda Lutzi. In the 5A competition, the top six teams were separated by less than three points with Milwaukie's Pony Prancers placing fifth after scoring 78.02 for their "Still Standing" routine, performing to the Karmina's "All The King's Horses." "We poured out everything on the floor," senior co-captain Leeah McCarthy said. "It was the best performance we've done all season. State was very competitive and came down to fractions of a point in the final scores, but we're happy." It marked the ninth consecutive top-five finish for Milwaukie, who edged Silverton by eight-tenths of a point for fifth place. "We left it all on the floor," said Brenna Weiler, another senior co-captain. "We did everything we could. We gave our best performance and it just came down to the judges' opinions and scores. We knew it would be a toss-up." Milwaukie coach Ryan Sanford agreed Friday's performance was the best of the season and a perfect tune-up for the Pony Prancers trip to USA Dance Nationals competition, which got underway Sunday in Anaheim, Calif.
"They were fantastic," Sanford said. "All season, it was a little rough for us to get into the swing of things, but as state season came around, they just took off and they definitely had their peak performance tonight. "We're taking this routine and another one with us to Anaheim, so, hopefully, the good energy will carry over to Nationals." In Friday's 6A finals, Oregon City's Jets performed "This Is Me" to Keala Settle's song by the same name and scored 67.37 — an improvement over last year's 65.85. "It felt really good," said Jets' co-captain Alexis Pearson, one of Oregon City's two seniors. "I think we left it all on the floor. We had been talking all season about this being our last performance and how it needed to our best one, leaving nothing to question."